1. Place arugula leaves in a mixing bowl and dress with olive oil and salt and pepper. Toss with tongs. 2. 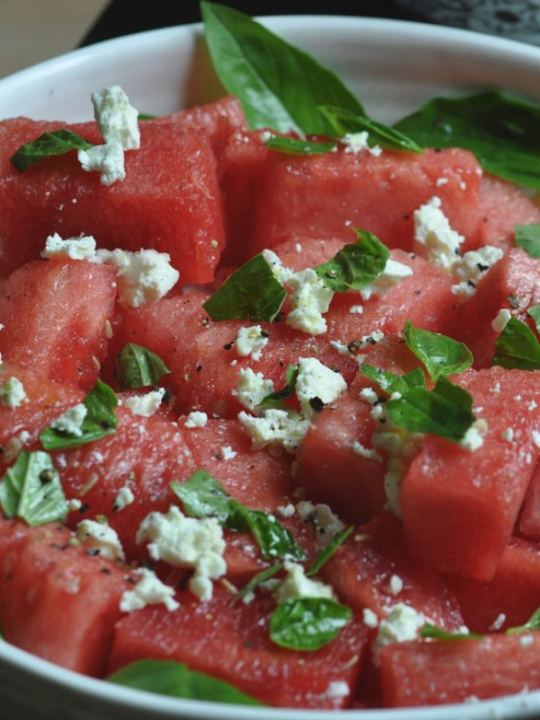 Divide arugula between 4 chilled salad bowls or plates and top with diced watermelon. 3. Top each salad with feta cheese and basil. 4. Drizzle reduced balsamic vinegar over and serve. You can purchase reduced balsamic but it is easy to make! Place 1 cup vinegar in a small saucepan over medium heat. Simmer and stir until it is reduced to a third (about 20 minutes). Cool to room temperature and pour into a squeeze bottle using a funnel. You can also write a love note on your bowl or plate with the vinegar. All fields and rating are required to submit a review.